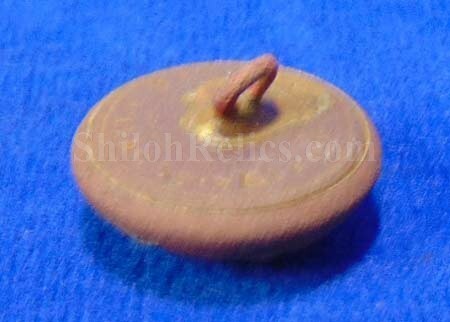 This is a nice looking excavated classic Civil War coat size cavalry uniform button. This is the style with the eagle on the front of the button. The eagle has the shield on her chest with the letter "C” which denotes the cavalry branch of service. This one still retains a fine amount of the original gold gilding after the many years in the ground. The button has the original back intact with the correct Civil War backmark of "SCOVILL MF'G CO. WATERBURY”. It has some of the beautiful original gold wash remaining on the face with fine detail. The verbal history that accompanied this button is that it was recovered in Charles City County, Virginia. 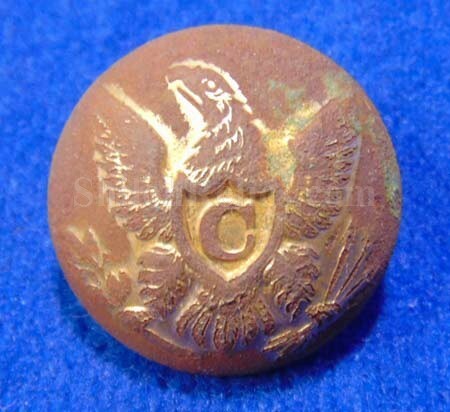 This is a very attractive Civil War cavalry eagle "C” button.